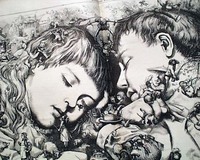 Offered is an original, historic, & collectible old newspaper: HARPER'S WEEKLY, New York, January 4, 1873 * Caricaturist Thomas Nast * Christmas - Santa Claus Certainly the most notable print is the great doublepage centerfold by Thomas Nast captioned: "The Same Old Christmas Story Over Again" showing two kids sleeping amongst their dreams. Santa Claus with his bag of toys is here as well. There are many other prints in the issue but they pale in comparison to this great centerfold. And This issue was never bound nor trimmed, with wider margins than normal, no binding holes at the central fold. 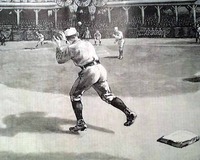 The condition of this Nast print is terrific. 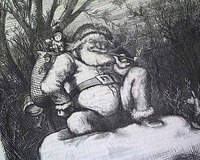 Offered is an original, historic, & collectible old newspaper: HARPER'S WEEKLY, New York, January 3, 1874 * Thomas Nast * Santa Claus * Christmas This is just the front leaf of this issue, which features a terrific & very desirable Thomas Nast illustration: "Christmas Eve - Santa Claus Waiting for the Children to Get to Sleep." 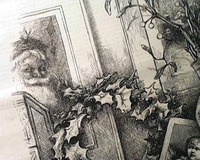 Nast Santa Claus prints are much in demand as he is credited with creating the modern "jolly" version of Santa. Very nice condition, light browning at the margin edges, very displayable. Offered is an original, historic, & collectible old newspaper: HARPER'S WEEKLY, New York, Dec. 30, 1876 * Santa Claus - Christmas * Thomas Nast print The full front page shows: "Christmas-Eve In A Light House". Inside has a fullpg: "Christmas Eve--Getting Ready For Santa Claus" "Christmas In A Fishing Smack" and a few others. 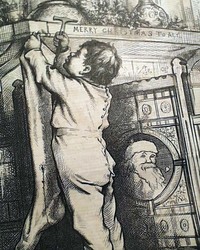 But the prime Christmas print has to be the very nice full page Thomas Nast print: " 'Twas The Night Before Christmas" showing a child hanging a Christmas stocking at the fireplace, with a cameo print of Santa Claus in the fireplace screen. 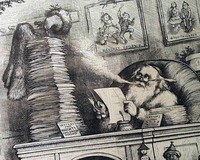 Nast is noted for creating the modern-day version of Santa Claus. Sixteen pages, never bound nor trimmed with wider margins than normal, minimal margin wear, very nice condition. 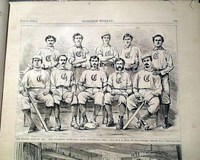 Shown is an original & historic old newspaper, offered to enhance your collectible interest: HARPER'S WEEKLY, New York, March 31, 1877 * Brooklyn Bridge - East River * Under construction print The full front page shows portraits of: "The Cabinet". Great fullpg. sailing ship illus. perfect for display: "The New U.S. Frigate Trenton". 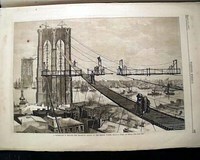 Great fullpg: 'The Brooklyn Ascent to the Bridge Tower" shows the famous Brooklyn Bridge under construction. Nast doublepage centerfold is a political cartoon. There is nearly a full page with three: "Random Street Sketches in Philadelphia",' mostly shows African-Americans. Sixteen pages, foxing & damp stains most at bottom margin, stain & hole to the front leaf, never bound nor trimmed. 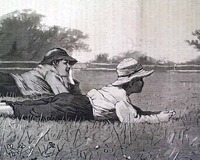 Shown is an original & historic old newspaper, offered to enhance your collectible interest: HARPER'S WEEKLY, New York, February 26, 1876 * Great rugby print - football The full front page is a Thomas Nast political cartoon: "Republican Simplicity". Full page Thomas Nast political cartoon: "No Rudder - No Aim"; half page: 'The Great Fire of February 8, 1876, On Broadway'; full page: "Uncle Sam's Valentines" shows 5 scenes; 3/4 page: "Gather Wood" Perhaps the most desired print is the great doublepage centerfold: "Foot-Ball at the Wall", which would be a rugby scrum scene. Complete in 16 pages, never bound nor trimmed, very nice condition. 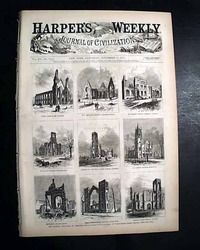 Shown is an original & historic old newspaper, offered to enhance your collectible interest: HARPER'S WEEKLY, New York, Nov. 11, 1871 * Great Chicago Fire of 1871 The full front page is taken up with 9 scenes of: "The Ruined Churches of Chicago". Another full page shows the ruins of Chicago after the fire, plus a half page as well. 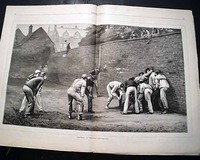 The double page centerfold is a very famous political cartoon by Thomas Nast: "The Tammany Tiger Loose" which is tipped-in (desired). 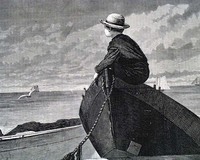 Another political cartoon by Nast as well, in addition to a full page showing: "The Yacht Race for the Queen's Cup" which has 9 prints. Sixteen pages, nice condition.